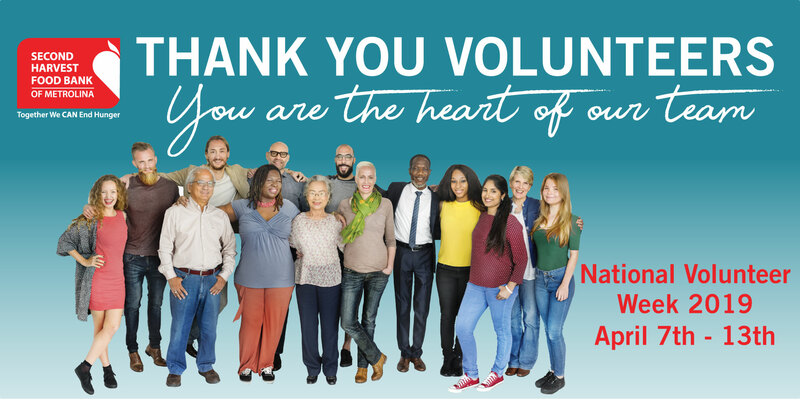 There are so many ways that volunteers for Second Harvest Food Bank of Metrolina help us make a difference to those struggling with food insecurity. These are just a few of them - if you would like to be a part of our #SHMETROLINA Volunteer team - click here to sign up today. Volunteers spend time at the food bank each week packing backpacks full of nutritious, ready-to-eat foods that are sent home on weekends and holidays when school meals are not available. Volunteers are always ready to assist during an emergency such as Hurricane Florence in 2018. With the help of our volunteers inspecting and sorting food, we distribute more than 54 million pounds each year. Volunteers help at our school-based mobile pantries. They provide on-site food including produce, meat and dairy for low-income families. Last year, volunteers donated 278,000 hours which equates to 6.4 million dollars in savings to SHMETROLINA. Volunteers help us pack nutritious food boxes each month that are distributed to seniors who daily choose between food or medicine. Are you interested in volunteering? Sign up here or contact our Volunteer Coordinator here for more information. Check out some of our wonderful volunteers who spent time with us this week here.